Margot Bigg uncovers colourful markets, sweet treats and lush gardens in the capital of Rajasthan. The fortified old town, dubbed the Pink City, is an ideal starting point for any visit to the capital. The area is so named for its salmon-hued buildings, originally painted to mark a visit by the Prince of Wales in 1883. Old Jaipur’s streets use a grid system so it’s fairly easy to get your bearings – at the heart is Tripolia Bazar Road, the central strip of the busy market thoroughfare that runs from Chandpol Gate, to the west, to Suraj Pol Gate in the east. Here you will find shops hawking plumbing supplies, ground spices and colourful bedspreads, as well as jewellers with wares ranging from plastic bangles to diamond rings. This is souvenir central, and is the best place in town to pick up a kitsch sandalwood elephant or elegant hand-embroidered shawl. Unless your visit is in the dead of winter, you’ll probably need a bit of respite from the sun, and there’s no better place to cool down than the Hawa Mahal (Palace of Winds). If you’re headed down Tripolia Bazar Road, it will be on your left, just past the City Palace. The Hawa Mahal was built in 1799 by the ruler of Jaipur, Maharaja Sawai Pratap Singh. The tradition of purdah, in which women are concealed from men, was followed at that time (as it is in many parts of Rajasthan to this day), and the palace served as a place for the ladies of the court to observe discreetly the goings-on of the market below. The five-storey palace is known for its 953 jharokhas (latticed windows) and ornate honeycomb façade. For many a heat-wary traveller, however, the palace’s most attractive feature is its natural system of air conditioning – the windows are angled to help circulate breezes throughout the single-room interior, and during the Hawa Mahal’s heyday, servants would pour water on the lattices to keep temperatures down. Open Sat-Thurs 9am-4.30pm. Entry Rs 50 (70p). Continue south along Johari Bazar Road and exit the old city through Sanganeri Gate. 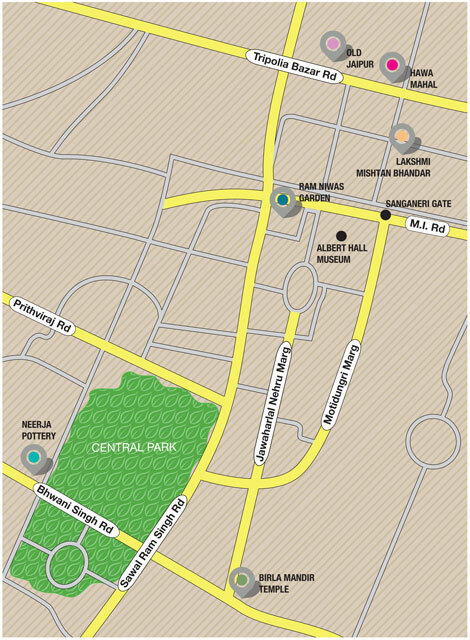 Just opposite is the Ram Niwas Garden, a 13-hectare expanse of lush greenery. The well-maintained garden is home to an aviary – featuring plenty of errant peacocks, India’s national bird – and Jaipur’s zoo. The main highlight is the Albert Hall, Rajasthan’s state museum. The venue houses a haphazard assembly of art and artefacts from across the world, including an Egyptian mummy. However, it’s the building’s architecture, not the collection, that draws in most visitors. The Prince of Wales laid its first stone in 1876 and it was constructed in the Indo-Saracenic style, a fusion of Mughal, Gothic and neoclassical elements that was popular at the time. It was modelled on London’s Victoria and Albert Museum, although the Albert Hall is much more Indian in appearance. The garden closes at sunset. Entry is Rs 100 (£1.40). South of the garden, on Jawaharlal Nehru Marg, the Birla Mandir is among Jaipur’s finest Hindu temples. This marble structure was built in 1988 under the benefaction of the Birlas, a prominent industrialist family known for continually building places of worship across India. Rumour has it that the family fears they will suffer bad luck if they stop, so they always have at least one under construction. As is the case with most Hindu temples, there are shrines dedicated to a number of deities, although the main focus of the Birla Mandir is Laxmi, the goddess of prosperity, and her consort Narayana, an incarnation of Vishnu, the god of preservation. For this reason, the temple is often referred to as “Laxmi Narayan”. Open daily 7am-12pm, 3pm-9pm.